Well now Christmas is coming at a very fast pace this year and makeup mirrors are in every woman's sights. Hi it's Deb from My Health and Beauty and today I am talking about makeup mirrors. If you look at the My Health and Beauty range it is easy to see we have the best available out there. If it needs to go in your purse, packed in a suitcase, free standing on the bath room vanity or suctioned to a mirror and even screwed to the wall lights or no lights Chrome, clear or gold finish then look no further. I see a lot of the online sites today and most are cheeky offerings meaning some buy from us at wholesale and rebrand it with their own name and sell at a more expensive price. I really do urge you to do your homework well when it comes to selecting a brand and checking the pricing before you make that purchase. Coupled with the US sites hiding the freight cost to get product into Australia, eBay with their junk offerings, and the Chinese product with no electrical certificates all working hard to part you with your hard earned money. Be careful this Christmas. The range in our store is second to none; if you are having difficulty making a decision give our customer service people a call (the number is at the top of the page) and they can help you narrow down on what will be the best for you. If looking for a magnifying makeup mirror to travel with then you can talk it over to see if you want a travel makeup mirror that is free standing and strong or find out is it better than a power suction and do I need a light ? Talking it over with customer service if you are not sure a 10x magnifying makeup mirror is to powerful. Having raised that point a 10x mirror like new glasses at the optometrist takes a couple of days for your eyes to adjust. It also takes time for you to get used to the fact your face is close to the mirror. Makeup mirrors come in all shapes and sizes and I can say it's difficult to have just the one makeup mirror to do the full range of jobs you would like. For this reason I recommend having three models and I have chosen a budget range and a high end range for you to consider. To carry around in your bag daily the MC310 is perfect in size, portability and weight, for travelling I recommend the PSC210 which can be placed anywhere, perfect size and perfect weight at 220 grams and finally for home in the bathroom the JP120 is a 10x model has a large 20.5cm diameter double sided mirror. For a higher end look the LEDT01 fits your bag perfectly and comes with a halo led light on both mirrors. To travel you have a choice of two the UL111 has duel mirrors one halo lighted the other not can be best set up in any location including hanging on the wall. It weights 500grams and is a substantial magnifying makeup mirror. If you want better portability and light then the PSC110 power suction LED halo lighted mirror at 220 grams in weight should be perfect. Finally it's hard to go past either the LED88C a double sided LED halo lighted mirror are for small magnification at 5x the JRT710 Rectangle is a classy middle and has been the pick by all the designers this year because of it fresh new style not yet copied by others. I know it all sounds like upsell I just don't feel there is a better way to handle the three different requirements us ladies have when we need a mirror. Hopefully you will use the advice wisely in the top half of this post as we want you all to have a wonderful happy Christmas with nothing but happiness and excitement, sharing and caring. Do you have a Makeup mirror with lights is one of the most asked questions we receive online and over the phone. Hi it's Deb again with some good ideas to help you with Lighted Makeup mirrors of which we have several in our range from the purse models, to travel models and finally the wall mounted and vanity models. All have their own unique uses and the first thing that comes to mind for me is you really need at least two makeup mirrors. One that's stays in the bathroom and one that can go with you either when you're travelling or just a daily use model in your purse. When out travelling, shopping or racing from meeting to meeting a lighted makeup mirror is indispensable. Preferably something that's bigger than the small compacts we used to use and fortunately these days Zadro has come to the rescue with the LEDT01 lighted makeup mirror. It folds out quickly and easily into many positions has two LED lighted mirrors one magnified mirror and one not magnified but both have a halo light you can turn on and off individually. Whilst most bathrooms in public buildings have reasonable light it's when you need to dash from the car into a meeting and you need to check you're looking your best this makeup mirror with lights is at its best. If you have more room in your bag or just want to leave a makeup mirror in the car or office drawer, maybe you are travelling then the ULT111 is fantastic. I love its size with two fold out makeup mirrors, the bottom unit magnified and lighted. This is a really steady unit as I said the size does it for me at 14cm which is just perfect. It does fold down flat however the best part is because the base is nice and sturdy it will extend out 40cm so that makes it an all-round useful makeup mirror with light available here in Australia. I can't go past the LEDPSC110 lighted power suction makeup mirror when travelling for the main reason is its so light and so handy to just suction on to a mirror or glass or tiles when you're in some strange hotel with poor lighting and only one mirror. I really hate waiting for my husband who is also in the bathroom and I can't use a mirror. It's just so easy to pull out this lighted makeup magnifying mirror turn the dial and it suctions onto the wall and I have a mirror I can see with and put my makeup on without my glasses. I use it with the light on when it's too dark but my favorite is to suction it to the window or glass door and use it with natural light. There are just too many to discuss here but our wall mounted makeup mirrors with lights are excellent from the view we offer direct wired models, or Plug in models and the cordless models. All different magnifications with 3x, 5x, 8x some single side others double sided for a nice range that all are made for here in Australia no crazy electrical voltage adapters needed. I can't finish this article without mentioning when buying online as a way of protection for you look for a phone number you can ring if you need to. Can you return goods here in Australia? Is the delivery going to be fast? Just little things to be reminded of instead of buying on price. Hi it's Deb again and today I'll help you make the right decision when it comes to selecting a travel mirror. Just lately the team here at My Health and Beauty have been fielding a lot questions about which mirror should they choose. Questions like does it fold down flat? Have a light? What weight is it? I guess weight is important when traveling considering how airlines are making it mandatory to travel lightly these days. We believe the travel mirror has to be practical also and fold down in to the neatest design or shape to get all the benefits or a small component in your luggage. The lightest and most compact of our range is the LEDT01 . It is just the right size to fit in your handbag and excellent for everyday touchups and can get by as your travel magnifying mirror at a pinch. Weighing in at just 280 grams and folds down completely flat comes with a lighted fold out arrangement it is also the smallest of the range. The next and most popular of the lighted magnifying mirror models is the PSC110 power suction mirror weighing in at 300grams. The best thing about this model is that it has a LED light that's very light on batteries and a great size mirror measuring 16.5 cm. Just a perfect size to do everything you want, best of all the easy power suction arrangement a quick twist for on or off the wall makes this a wonderful mirror to use. You can hold it in your hand or wall mount it in seconds. Its does not fold down completely flat as the knuckle on the back of the mirror makes it stand up a little. When I take mine away I wrap it in some soft clothing and place it in a part of my case that's not packed super tight. The sister model to the lighted power suction mirror is the PSC210. It is square with no light. Being the same weight at 300grams and has the same folding folding knuckle that does not allow it to fold flat. It is extremely popular because of the square shape. My friends say it gives a better look about your image than the round lighted power suction mirror. Being able to put this magnifying mirror up anywhere is a bonus. I find using natural light is fantastic so its easy to sit outside and attend to those annoying little eruptions or blemishes. The traditional MC229 is a very stylish magnifying mirror to look at with its silver and gold finish on the stand that encloses the mirror. It allows you to sit the mirror on any flat ledge or surface adjust it in any direction being a double side mirror with slightly less magnification at just 7x. This mirror weighs a little more than the power suction models at 400 grams and that's because it's a more solidly built mirror. The MC449 is a polished stainless steel finish model that has the by far the best multiple position stand, coupled with double sided 14cm diameter crystal clear magnifying mirror that can be adjusted to stand 27cm high this mirror is a very solid model weighing in at 490grams. It folds down to just 5cm flat and stores away in a lovely black velvet bag. Packing away in your suitcase that sometimes gets thrown around should not worry this beauty. I must say having had one of these for a long time I found you should always keep a piece of cardboard between the glass surface and the frame when the mirror is folded down. Our final travel magnifying mirror the ULT111 is brand new to the range and is very practical with its two fold out mirrors, they look huge in size at 16cm in diameter, LED halo lighted, a small digital clock in the stand and a new finish for us here in My Health and Beauty that being ivory. Best of all it folds down to just 5cm high and weighs in a 500grams. The mirror then stores in a black velvet carry bag. Well I hope you will get some idea on what travel mirror may choose hopefully this post has given some extra information that works for you. 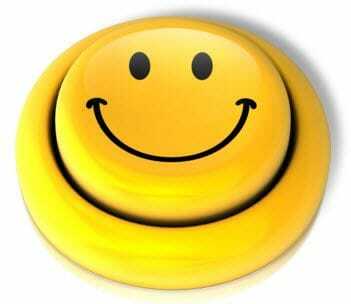 Thats all for now, please - Smile everyday is a great day. Can't Find the Magnifying Mirror You Saw on the Site. 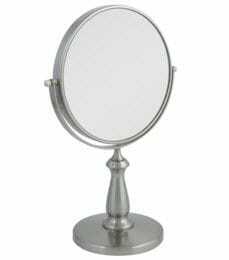 Hi everyone its Deb again with just a short post today on why you sometimes cannot find a magnifying mirror in the web store you saw previously and wanted to buy. Just lately we have received calls from customers enquiring about a magnifying mirror they saw on the MyHealthandBeauty site last week or they were reading the blog post about a new model but can't find the mirror to buy. The answer is when stock reaches Nil in the warehouse we take the mirror off the website until it comes back into stock. We do not want to inconvenience our customers by taking payments and then being advised there is no stock. The mirrors will be put back online as soon as we have a fixed date the stock will be back in the warehouse. Sometimes the mirror will appear back on the site as soon as we have a fixed date of arrival. That date is messaged across the mirror. The less we can inconvenience our customers the better. We also want you to know that we pack and post the same day as your order which generally means if Australia post is on track you should receive your parcel inside 3 or 4 days at the very worst. The team at myhealthandbeauty wants to ensure you have a good experience and making sure customers receive their purchase as fast as possible is part of the plan. Please don't leave it for two weeks before you call. Our systems can get to the issue very quickly why your purchase has not been received. I have been putting together a block of articles which gives critical measurements on the wall mount magnifying mirror range to facilitate for those who want to mount their lighted magnifying mirrors inside a cabinent. I expect to put that information on the site over the coming week. I hope this will be useful information for many. I hope you have enjoyed this small piece of advice.